Here’s a shameful secret: Back when I started my Unfinished Song fantasy, I wasn’t trying to be fresh, original or non-Western. In fact, I wanted to write a “classic” fantasy. I knew I wanted actual pixies and faeries in it. 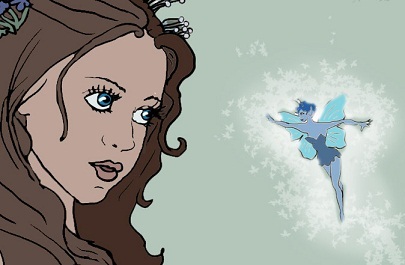 I wanted it to be both epic and a fairytale—an epic faerie tale. I knew I wanted the magic to be based on dancing and color, and that the ability to dance the whole rainbow would be almost extinct in their world. Other than that, I just planned to include all the tropes of the genre. Young scion of farmers sets off on a quest, finds a magic doo-hickey, and turns out to be the only one with the power to save the world. The setting was cliché because I didn’t feel like investing the time in world-building for a mere “practice” story. My original heroine, Dindi, was a peasant girl; my original hero, Kavio, was a prince. I wrote three chapters in this frame of mind, seat of the pants, no plan, no world-building, not really taking the story seriously. It turns out I love world-building. It’s one of the reasons I read and write fantasy. Without that investment in a unique and gorgeous world, I just couldn’t find the enthusiasm I needed to write the story. I set it aside for a while. What knocked sense into me? I don’t know. A fairy whispered in my ear that I needed to change the setting. It needed to be set in a time I had never seen a fantasy set before: with Neolithic rather than medieval technology. The Neolithic Era was a particular time period in human history, but it also refers to a stage of civilization, and I use it in the later sense. Neolithic, or “new stone age” technology means that the people primarily use flint and obsidian tipped arrows and spears. They don’t have bronze or iron. They don’t have swords. They don’t have castles. They don’t have scrolls or books or libraries. They don’t have lamps or arches or sails. They aren’t cavemen, however. They have sophisticated pottery, weaving, rugs, sewing and dyes. They smelt gold. They don’t have kings or feudal lords or priests, but they do have the beginnings of a more caste-divided society and hierarchy. While I don’t know how this idea came to me, I do remember how it energized me. The whole story excited me again. The early time period worked for three reasons. One, the main storyline was inspired by a Polynesian myth, so this was a tip of the hat to that non-European setting. Two, it fit my fancy that the events of the Unfinished Song were the “original” and “primordial” events which are the secret roots of all our fairy tales. We know that the story of Cinderella as recorded by the Brother’s Grimm was not the only or original story. What if it were a distorted version of something that happened during the Dreamtime of the human race, when all myths and fairytales were real? I don’t actually use the term Dreamtime in my story (which is from Aboriginal legend), but I drew on that concept in how I thought about the story. Two, every culture around the world has gone through a stage of Neolithic level technology. Some cultures, like Asia and Europe and the Incas and Aztecs and great empires of West Africa, later moved on to more sophisticated technologies, involving iron and feudalism, but everyone at one time used spears and swords. Every place on earth has immense, mysterious monuments made from dragging big stones around. This meant that I could easily mix and match my cultural inspiration. I could use Hopi agriculture, Celtic pig-farming and musical traditions, Zulu warfare, West African Initiation ceremonies, and so on. For the hero and heroine’s people, I drew strongly on Hopi and Zuni cultures, which has led some readers and reviewers to think that the entire culture is based on Native American history. One reviewer expressed disappointment when horses turned up. That was actually a difficult choice for me, and sometimes I do wish I had left them horse-less. However, I included it because there are so many interesting horse-centered cultures in the world, and I wanted to explore that with one of the tribes. Three, the excuse to research obscure and exotic Neolithic cultures ignited my enthusiasm for the story, and has kept me excited about it ever since. The biggest problem with the standard fantasy pseudo-medieval-pseudo-European setting is not that it is medieval or that it is European or even that it has been done before. It is because the writer doesn’t take the time to study real history (or “real” mythology) as a model, but simply bases their own world on worlds in other fantasy books. The result has much the same problem as cloning a clone, or xeroxing a xerox. The quality fades the more derivative your product is. The original research behind Kushiel’s Dart by Jacqueline Carey or The Hallowed Hunt by Lois McMaster Bujold, shines through, and those stories don’t come across as McClones of McFantasyLand at all. I have a Master’s Degree in History, admittedly, so that’s a clue about how deeply I adore history. I adore research in musty old libraries and when I do internet research, it’s in JSTOR, not Wikipeadia. I’m a glutton for eight hundred page tomes on the kinship systems of Melanesian islanders. I also love anthropology, archeology, sociology, just about any –ology you can think of. I’m a nerd’s nerd, in the liberal art’s spectrum of the Geek Rainbow. This is not to say that there weren’t challenges in leaving the beaten path. Do you know how many times I would have a character about to open a door, or knock on a door, or slam a door before I remembered that they don’t have doors! Oy. People! Invent hinges already! It’s also hard to give my hero a truly Cool Weapon of Power when they don’t have swords. But even challenges can create interesting opportunities. I gave a supporting character a Singing Bow, which can also be made into a harp. This idea came from a historian who speculated that the first stringed instruments were actually bows that warriors plucked when they were sitting peacefully around the campfire, bored and (almost certainly) drunk. There’s so much human history and so many different cultures to study for inspiration for fantasy which have yet to be mined. The real is so much more fantastic and bizarre than most of what is portrayed in fantasy and science fiction as exotic or alien. One of the reasons to read these genres is to stretch our imagination and our empathy. We shouldn’t shortchange ourselves by re-treading the same worn paths, but should be brave enough to follow history back along rarely explored by-ways for inspiration. Thanks to Tara Maya for the guest post! 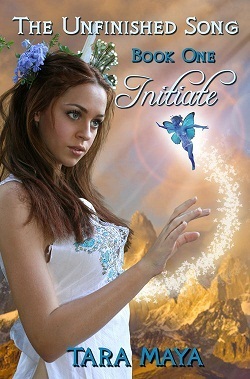 You can find her book The Unfinished Song: Initiate on Amazon, the first of a series. The Kindle edition of the first book is free! This entry was posted in Books, Fantasy, History and tagged books, fantasy, neolithic. Bookmark the permalink. Wow, sounds great! I’m ordering it now. I admit to being addicted to Celtic fantasy, which tends to be European. But I really like going back to the roots, before Christianity spoiled everything. Another fantasy set in ancient history is Daughter of the Goddess Land, and the sequel, Shadow of the Horsemen, by Sandra Saidak. She did the same thing with horses, that Tara mentioned. One of her cultures describes the other as “men with six legs” because they’d never seen anyone ride an animal before. It’s fascinating to explore how our societies evolved like this. The setting is one of the stars of the series. It’s as critical to its story as Hogwarts, and every bit as immersive. Your books sound fascinating. I love pre-historic settings. Great post, Tara! “The quality fades the more derivative your product is.” Such a good point. I’m especially irritated by novels that blindly mix elements of the late medieval/Renaissance period with ancient times. My fantasy novel is based on pre-Crusades medieval Europe, right in that doughnut hole of European history, where Charlemagne bumbled around in a world that was much different than the world of the later legend of Charlemagne. I’m doing a ton of research and taking a similar route as you in plucking elements from different cultures, but the same time period, to build my alternate universe. 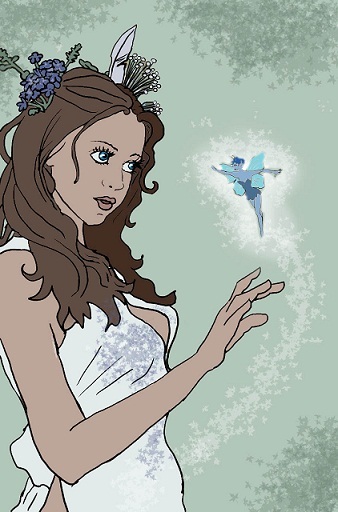 Not sure about the fairy as depicted on the cover, though; no objection to faeries per se, but have a marked aversion to anything that seems a bit ‘cutesy’ or Tinkerbell-ish! Just a personal thing. Reading folklore as I have for many, many years (god, I feel old!) I don’t see a lot of ‘cute’ there. Prehistoric and historical novels in general do seem to be coming back into vogue, which is a good thing. My own novel STONE LORD is out fairly soon, and is set in the early British bronze age. Downloaded a copy of this onto my Nook and I’m looking forward to reading it.